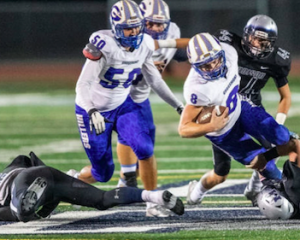 SAN DIEGO – Since Tom Karlo took over as head coach at Grossmont High in 2012, the Foothillers have made a habit of staging some epic shootout playoff games. This one on Friday night, however, might just take the cake. 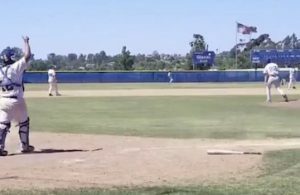 In the first round of the San Diego Section Division I playoffs, Grossmont led mighty Madison by 24 points until the final play of the first half. JAIME ODOM runs against Madison on Friday night. Then, amazingly, Grossmont found itself losing by four points until 35 seconds left in the game when Jaime Odom hit Brody Schicker for a 26-yard touchdown pass to put the Foothillers back on top by two points. Then, with Grossmont leading 44-42 and 0:07 to play, Madison was facing a second-and-4 from the 30-yard line when the Madison stadium lights suddenly turned off and darkness prevailed for the next 25 minutes. Finally, after the lights were rebooted, on the last play of the game, Madison missed a 38-yard field goal attempt, and the Foothillers hung on for the 44-42 upset of a team many had pegged for one of the four coveted Open Division playoff spots just a few weeks ago. “What a great game!” a relieved Karlo said after the nearly 3½-hour contest that produced 1,001 total yards, 86 points, dozens of momentum swings and a 10-minute delay as the referees discussed and finally overturned a critical call against the Foothillers that eventually led to Grossmont’s winning score. Madison (6-5) had been ranked as high as No. 3 in the San Diego Section earlier this season and was seeded No. 6 in these Division I playoffs. With only its fourth win of the season, No. 11-seed Grossmont (4-7) earned a quarterfinal date with No. 3 Helix (6-4) next Friday at Helix. Grossmont hasn’t beaten Helix since 1991, losing 22 straight to the Highlanders, including playoff losses in 2004 and 2008. Helix, last year’s Open Division champion and a state runner-up to Folsom in Division 1-A, defeated Grossmont, 27-0, on Oct. 12 in a game called at halftime because of continued lightning strikes. Grossmont played in the Open Division the last two seasons, and the Foothillers were knocked out in the first round both times by Mission Hills – by scores of 52-42 last year and 49-48 in 2016. In 2015, the Hillers lost a Division I quarterfinal against Steele Canyon, 39-35. In 2014, Grossmont beat Westview 56-34 before La Costa Canyon claimed a 47-28 win in the Division I quarterfinals. In 2012, the Foothillers beat Rancho Buena Vista 55-34 before Eastlake outscored the Foothillers, 59-37, in the semifinals. Grossmont started playing football in 1920 and Madison in 1962, but this was the first-ever meeting between these schools, despite their relative successes over the past two decades. MONRAY CANADY, a senior, rushes for Grossmont on Friday night. 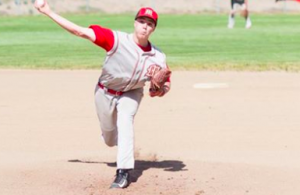 Odom, a junior quarterback, was simply outstanding. “It’s an amazing feeling,” Odom said. “The last couple of weeks we’re coming together nicely as a team. Odom came into the contest with 149 rushing yards and three touchdowns in his first 10 games. Against Madison, Odom rushed 28 times for 230 yards and three touchdowns. “Throughout the week, our game plan was just to get me to run the ball,” Odom said. “Just help out the offense. 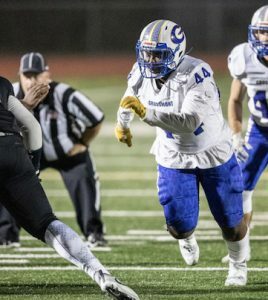 Indeed, Grossmont’s line of Sean Rude, Nathan Kitchen, Andru Sanders, Raymond Lira and Kevin Acosta continually opened up a middle running lane for Odom as well as outside paths for Robert Tucker, Damari Crawford, Thomas Mangum and Desmond Carter – a quartet that combined for 89 yards. As a team, Grossmont rushed for 319 yards. Through the air, Odom completed 16-of-30 passes for 211 yards and a pair of touchdowns to Schicker, including the 26-yard game winner on a spectacular diving grab at the goal line as Schicker got behind Madison’s Deen Banks. Karlo was even more praiseworthy of Odom. Grossmont finished with 530 total yards and 26 first downs on 81 plays. Madison had 471 total yards and 18 first downs on 49 plays. Madison had allowed only 13.0 points per game coming into Friday’s game. Grossmont had a 14-0 lead less than seven minutes into it. Mangum returned the opening kickoff 70 yards, and three plays later, Odom hit Schicker on a 16-yard touchdown pass just 1:06 into the match. Grossmont’s defense forced a three-and-out, and Madison had to punt on its first possession. Unfortunately for the Warhawks, their best player sustained a knee injury on Madison’s second play from scrimmage. Kenon Christon, who is committed to USC, took a helmet to his right knee after a 2-yard loss on his only carry of the game. Christon, one of the fastest sprinters in the state, spent the rest of the game on the sideline with an ice pack wrapped around his right knee. Christon had 982 rushing yards and 11 TDs coming in. He had 1,233 yards and 16 TDs as a junior when Madison lost to Helix, 19-11, in the first round of the Open Division playoffs last year. He had 829 yards and nine TDs as a sophomore when Madison beat St. Augustine for the section Division I championship and later beat Valley Christian for the state title in Division 2-AA. Even without Christon, Madison is still very dangerous with Daniel Stokes at quarterback and Ke’ontae Springs at tailback. Stokes rushed 13 times for 216 yards, including second-half touchdown runs of 88 and 42 yards. Springs rushed 13 times for 75 yards, including TD runs of 1 and 24 yards. Stokes also threw for 150 yards on 9-of-15 passing with touchdown tosses of 18 and 6 yards to Springs, who finished with six catches for 80 yards. Oddly, Madison’s first completion didn’t come until 19 minutes into the game, but it was a 48-yard pass from Stokes to Herman Smith. On Grossmont’s second possession, the Foothillers drove 70 yards in 13 plays and took a 14-0 lead on a 6-yard TD run by Odom. Madison finally got on the board with a nine-play, 65-yard scoring drive as Springs bulled in from 1 yard to make it 14-7 with 1:05 left in the first quarter. Grossmont responded with a nine-play, 55-yard drive and took a 17-7 lead when Alex Gonzalez converted a 24-yard field goal at 10:11 of the second quarter. The Hillers were far from done. They took their next drive 75 yards in nine plays, and Odom scored on a 3-yard run at 5:20 to make it 24-7. Five plays later, Grossmont went on a seven-play, 72-yard march, and went ahead 31-7 after Odom scored on a 25-yard bolt up the middle with 0:44 to play before intermission. Madison’s fire looked doused, but Stokes stoked the embers for an improbable score on the final play of the half. Starting at its 20-yard line, Stokes hit Tyson Gangstad for a 12-yard gain, followed by a 46-yard gain by Stokes. Madison appeared to score on the next play but was whistled for having a lineman downfield on the pass. Grossmont’s Austin Wittmayer intercepted the next pass near the goal line and returned it 34 yards, but the Foothillers were penalized for having 12 players on the field. A Madison procedure penalty pushed the ball back to the 18-yard line, but the Warhawks were given one final play with 0:00 showing on the clock. Stokes drilled a pass into the front of the end zone, and Springs wrestled it away from a Grossmont defender for a touchdown to make it 31-14 Grossmont at the half. Odom already had 141 rushing yards and three touchdowns, plus he had thrown for 96 yards and another score. Grossmont had 249 total yards in the first half, plus Mangum’s 70-yard kick return. Madison got the ball to open the second half and promptly reeled off a six-play, 66-yard scoring drive with Springs getting a 24-yard TD to tighten the score to 31-21 at 8:40 of the third quarter. Grossmont responded with a 15-play drive that stalled at the 33-yard line after a holding penalty. Zak Farris’ punt pinned Madison to the 12-yard line, but the Warhawks – like Grossmont – are accustomed to scoring from anywhere on the field. Sure enough, Stokes took the next snap and raced 88 yards into the end zone to pull within 31-28 with 1:30 to play in the third quarter. Odom and Grossmont went back to work on the ensuing possession. Odom gained 15 yards on one run, connected with Carter for a 23-yard pass and Mangum picked up 13 yards on a sweep before Odom fired to Crawford for an 18-yard pass gain to give the Hillers a first-and-goal at the 3-yard line. Next play, Crawford burst up the middle for the score and Grossmont was ahead 38-28 with 10:48 to play. The drive covered 72 yards in nine plays. 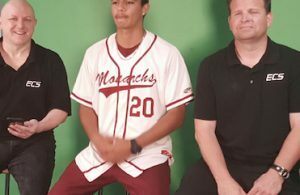 Under head coach Rick Jackson, Madison has won three section championships and two state titles in the last 10 years, so you just knew the Warhawks weren’t going to roll over. Sure enough, the Warhawks reeled off an eight-play, 66-yard drive capped by a 6-yard TD pass from Stokes to Springs to pull within 38-35 with 7:28 left to play. Five plays later, Grossmont had to punt, and Madison took over at its 24-yard line. Six plays later, Stokes found a running seam down the right sideline and his 42-yard sprint gave Madison its first lead at 42-38 with 3:10 remaining. Give Odom, the offensive line, wide receiver Skip Waltower and Karlo credit, the Foothillers refused to quit too. On third-and-10 from the 33-yard line, Odom hit Waltower on a screen play that covered 17 yards but was initially called back for an illegal man downfield flag from the far-side line judge. After much discussion and a check of iPads from both sidelines, the flag was picked up and Grossmont was eventually and rightfully given a first down at the 50-yard line. Five plays later, Odom ran for 17 yards to the 34-yard line, but after another penalty the Foothillers faced a fourth-and-11 from the 39-yard line. No matter, Odom zipped a low pass into the sliding body of Waltower for a 13-yard pickup and a first down at the 26-yard line with 0:42 to play. 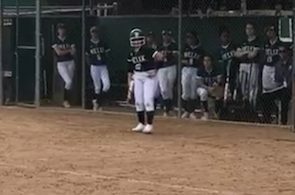 As things would go on this night, the next play produced the final and winning score – Odom’s perfect toss to Schicker – with 0:35 to play. The game wouldn’t end for at least another 30 minutes of real time. First, Gonzalez missed just the third PAT kick of his season so the score stood at 44-42. Madison got a 21-yard return on the kickoff by Springs. With 0:19 left, Stokes rushed for 12 yards. After a personal foul penalty against Grossmont, Springs sprung for 6 yards to give the Warhawks a second-and-4 from the 30-yard line with 0:07 left. Sorry Pat Travers. Sorry sportswriters on deadline. Sorry fans hoping to get home before 11 p.m.
An apparent power outage was to blame. And this delay would last about 25 minutes. Three weeks ago, Madison was trailing St. Augustine, 24-7, with 0:46 to play in the third quarter when the infamous lightning storm postponed that game. Three days later, St. Augustine returned to Madison, and the Warhawks staged a stunning come-from-behind 27-24 victory on a Monday. In the 2016 section Division I championship game at Southwestern College, Madison trailed St. Augustine by 24 points in the second half before pulling out a 35-31 win en route to Madison’s second state title. Could the Warhawks somehow pull off another miracle? When the lights finally came back on, Stokes took the shotgun snap from the 30-yard line and gained 8 yards with 0:03 showing on the clock. After a timeout, Madison lined up for a 38-yard field-goal attempt. Mauricio Escodero had plenty of leg behind the kick, but the ball sailed just left of the uprights, setting off a wild celebration by the Foothillers. “It’s a tough thing emotionally, to go up and down like that,” Odom said. “We just tried to stay steady and do our thing. “Fortunately it worked out well for us tonight.